It was expected to be a day for the breakaway. The favourites would be keeping their powder dry for the penultimate stage, the summit finish to the Bola del Mundo, and the peloton would let the breakaway fight it out for the spoils of the stage win. Except someone forgot to tell Alberto Contador. He and his Saxo Bank-Tinkoff Bank team-mates turned the Vuelta on its head with an audacious and stunning attack over 50km from the finish to take stage 17 and, vitally, the race leader’s red jersey. The Spaniard well and truly stuck the knife into Joaquin Rodriguez’s chances of overall victory. His compatriot on the Katusha team finished over two and a half minutes behind Contador and lost the lead in a race that just five hours earlier he must have believed he had all but won. Alejandro Valverde (Movistar) twisted the knife further, almost catching Contador on the line but leapfrogging Rodriguez into second place overall. Following the second rest day and a brutal three days in the Asturias, demand was high to make the breakaway, in particular amongst the 14 teams yet to win a stage. A long but gentle finishing climb offered, it seemed, little for the overall favourites to make a difference. Indeed it took around 80km, raced at speeds nudging 48kmph, for eleven riders to break clear. Yet they returned to the sights of a peloton chasing hard with a little over 60km to race on the slopes of the third category Collado de Ozalba. A large chase group swiftly splintered clear and contained, crucially, three riders from Saxo Bank and two from Movistar. 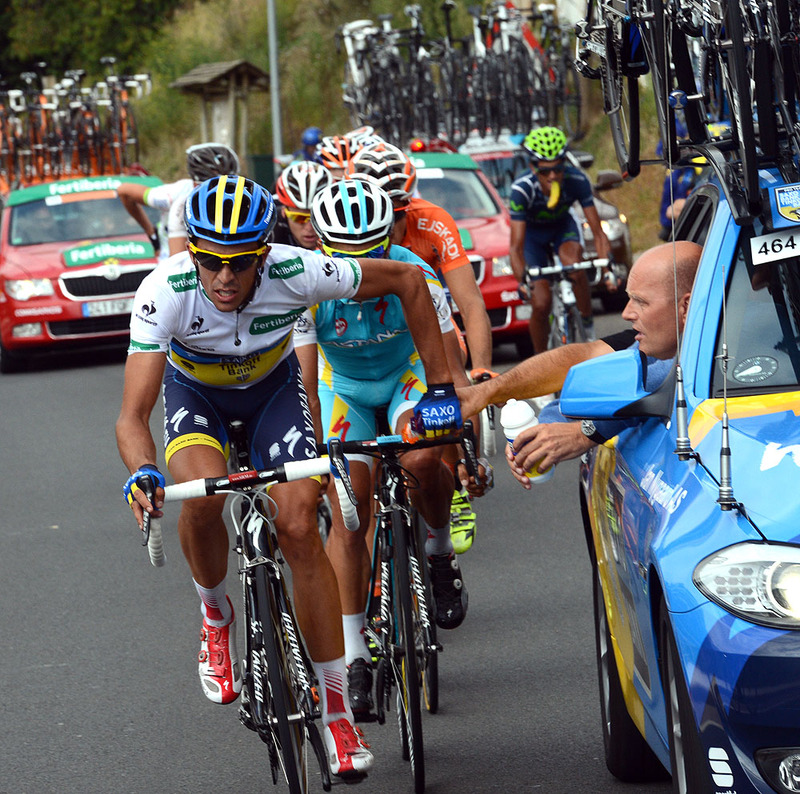 Right on cue, Contador surged clear from the bunch and joined his team-mates to execute the plan. A tired Rodriguez was caught off guard and seemed incapable of halting the action unfolding in front of him despite his best efforts at the head of the chase. The shallow gradients of the final climb to Fuente De suited the powerful Contador above the punchy Rodriguez and it showed. In fact it was Valverde who came close to unravelling Contador’s plan, jumping clear of Rodriguez and teaming up with his two Movistar team-mates up the road. 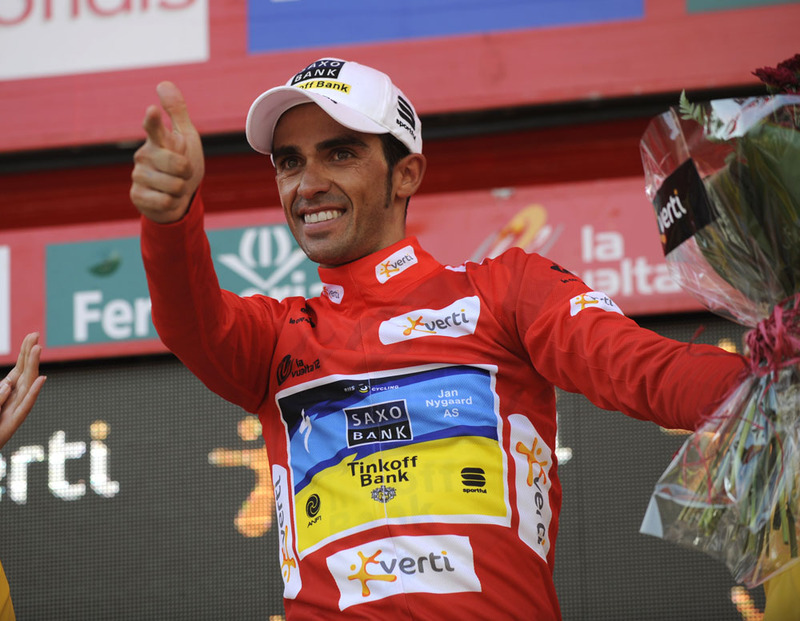 Six seconds was the closest Valverde came to Contador, right on the finish line, but it was enough to claim second overall as Rodriguez finished a further 2-31 back. 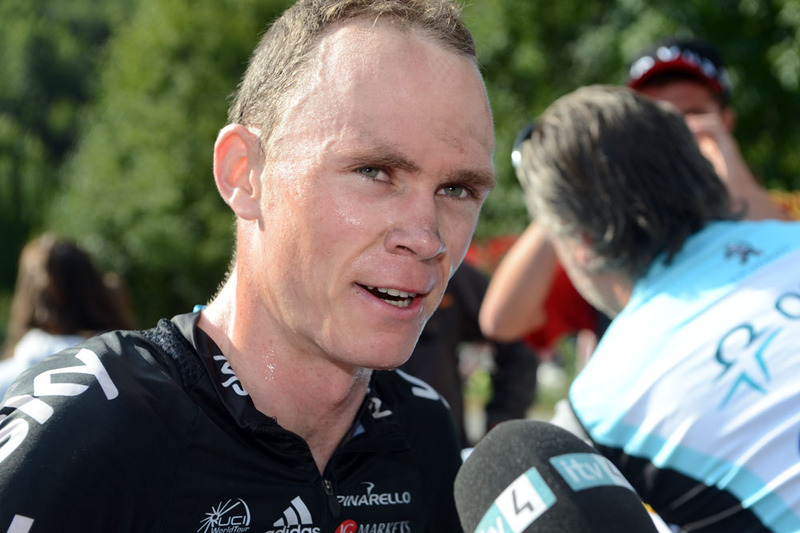 Britain’s Chris Froome (Sky), who suffered on the previous stage to the Cuitu Negru, was once again off the pace and finished nearly five minutes down on Contador. His fight for the podium is well and truly over, but his three minute lead over Daniel Moreno (Katusha) looks to be enough for fourth overall. In the fight for the podium, the tables have been turned. Where Contador spent his rest day plotting to take the red jersey from Rodriguez’s shoulders, that task is now handed to Rodriguez and Valverde. Yet with just four stages remaining their time is fast running out. 3. Sergio Henao (Col) Sky s.t. 4. Gorka Verdugo (Spa) Euskaltel-Euskadi s.t.